SimpleFiles is the PUP that uses misleading techniques to prevent removal. Use Reimage to locate malicious components and get rid of them faster than with uninstall instructions. A full system scan blocks virus reappearance and prevents traffic to malicious domains. How can SimpleFiles hijack my computer? How to remove SimpleFiles virus? SimpleFiles by Blisbury LLP has been categorized as a potentially unwanted program (PUP) and an adware, so you should think twice before downloading it to your computer. Yes, this program works as a download manager; however, it has been noticed that it is supported by third parties that are seeking to increase their popularity with its help. That’s why you may notice various suspicious activities on your computer right after installing this program on your computer, as well as SimpleFiles redirects to questionable websites, annoying ads, slow downs and similar issues. Once this suspicious program enters PC system, you may notice various pop-up ads that may appear on every website that you visit. Typically, such SimpleFiles ads appear in a form of pop-up ads, banners and similar notifications that are filled with random commercial offers. If you have already noticed such messages, note that ‘Ads by SimpleFiles’ and similar notifications are sponsored by third parties that seek to redirect you to affiliate websites. In addition, you may notice various notifications suggesting you to download such questionable applications as system optimizers, free updates and similar applications. It is not recommended trusting such and similar suggestions because they seek the only thing – make people install questionable programs on their computers. Finally, SimpleFiles has also been noticed for promoting other PUPs, such as Delta Toolbar, in a bundle. If you, after installing this application on your computer, have noticed that your homepage and the default search engine were altered without your direct permission asked, you should waste no time and scan your PC with Reimage or other reliable anti-spyware. 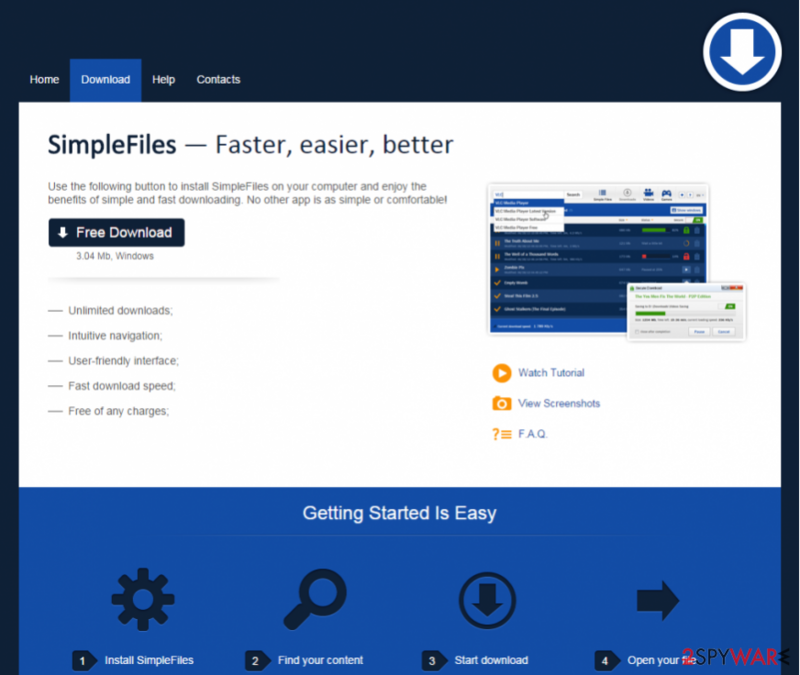 SimpleFiles can be downloaded from its official site simple-files.com. However, you should be careful because it may trick you into installing useless components. However, this application may also appear on your computer without even noticing that. It may appear on your computer right after the installation of various free programs that are promoted on third party-supported download websites. If you have recently installed any kind of free program and did not pay much attention to its installation process, it is not surprising that you are now experiencing SimpleFiles redirects, ads, and other inconveniences. To avoid this, be careful while installing freeware on your computer: do not rely on Recommended or Quick installation method and trust only Advanced or Custom installation technique. In addition, you should opt out of all suggestions to change your home page or default search engine, to install toolbars, add-ons or extensions that are typically presented in small font. If you have already ended up with SimpleFiles adware on your computer, you should use a guide below and fix your computer. Here, look for SimpleFiles or any other recently installed suspicious programs. Wait until you see Applications folder and look for SimpleFiles or any other suspicious programs on it. Now right click on every of such entries and select Move to Trash. When in the new window, check Delete personal settings and select Reset again to complete SimpleFiles removal. Once these steps are finished, SimpleFiles should be removed from your Microsoft Edge browser. Here, select SimpleFiles and other questionable plugins. Click Remove to delete these entries. Now you will see Reset Firefox to its default state message with Reset Firefox button. Click this button for several times and complete SimpleFiles removal. Here, select SimpleFiles and other malicious plugins and select trash icon to delete these entries. Click Reset to confirm this action and complete SimpleFiles removal. Here, select Extensions and look for SimpleFiles or other suspicious entries. Click on the Uninstall button to get rid each of them. Now you will see a detailed dialog window filled with reset options. All of those options are usually checked, but you can specify which of them you want to reset. Click the Reset button to complete SimpleFiles removal process. This entry was posted on 2015-09-14 at 07:14 and is filed under Adware, Viruses. How did you remove SimpleFiles?